On 9th August 2014 Sr. Helina made first Profession of vows during Mass in St. Joseph's Convent, Littlehampton. 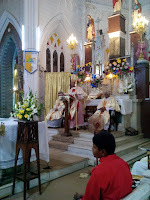 Mass was celebrated by Fr. Austin McCormack OFM at the end of a retreat in the convent. Fr. Benedict Ngozi, Sr. Helina's uncle was among the concelebrants. Other members of Helina's family had travelled to celebrate her commitment with us, some from as far as Nigeria. We congratulate Sr. Helina on her commitment and invite you to join us in remembering her in prayer. On 2nd August 2014, Sisters Marcellina and Patricia were received as novices at St. Joseph's Convent, Littlehampton. Their next two years of novitiate training will be in Canterbury Community with Sisters Susan and Clare Bernadette. Please remember them in your prayers. In the summer of 2014, Sr. Attracta began part-time work as a volunteer in the wards of Kent and Canterbury hospital. While applying for a degree in adult nursing at Brighton University, it was an opportunity to experience the daily routines and hectic pace on the ward, to learn how some medical equipment is used and see good caring professional nurses in action. 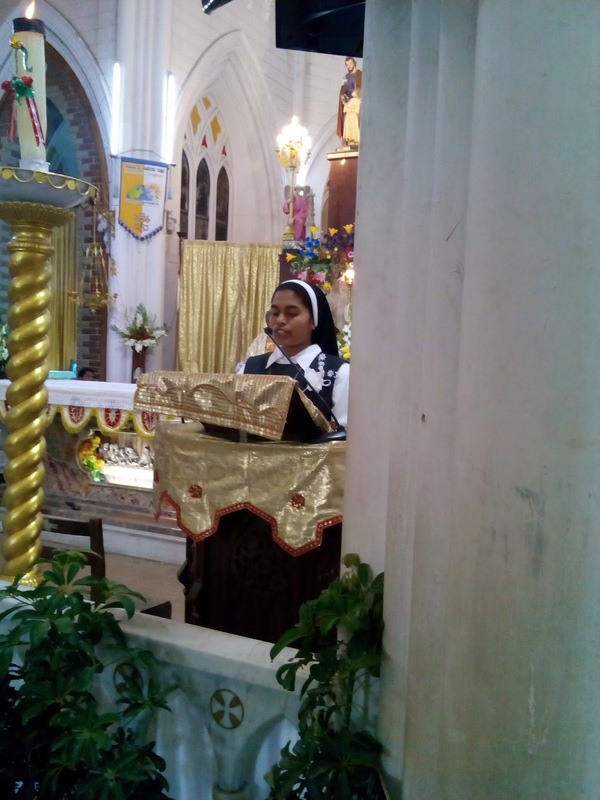 In 2014, Sr. Attracta also followed a course for training hospital chaplains at K & C hospital. This involved learning the theory of ministry in healthcare chaplaincy and also praying with the ecumenical chaplaincy team and accompanying chaplains on ward rounds. 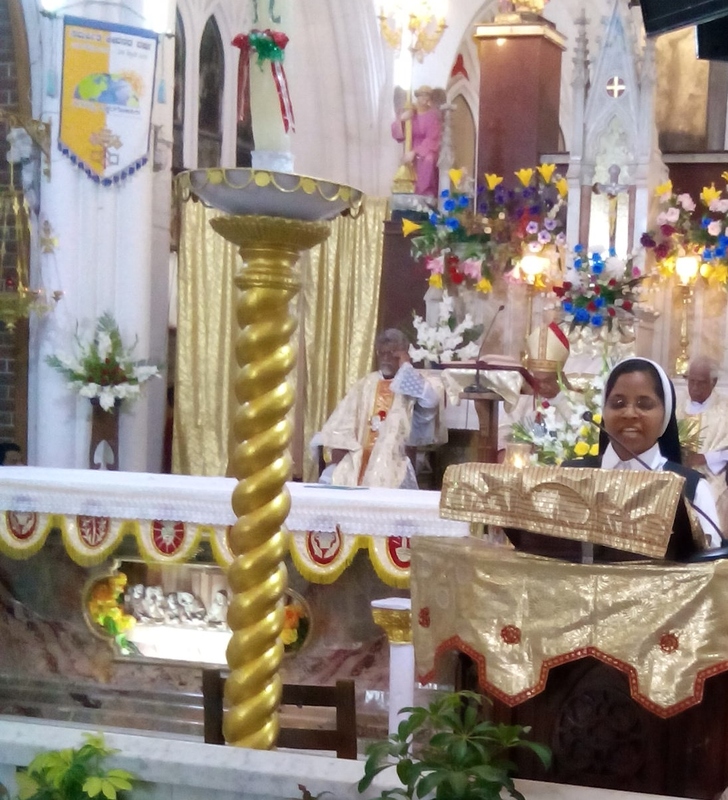 At the end of July 2014, Sr. Attracta completed the training course and received her certificate with the other new chaplains in a ceremony at the Franciscan Study Centre. 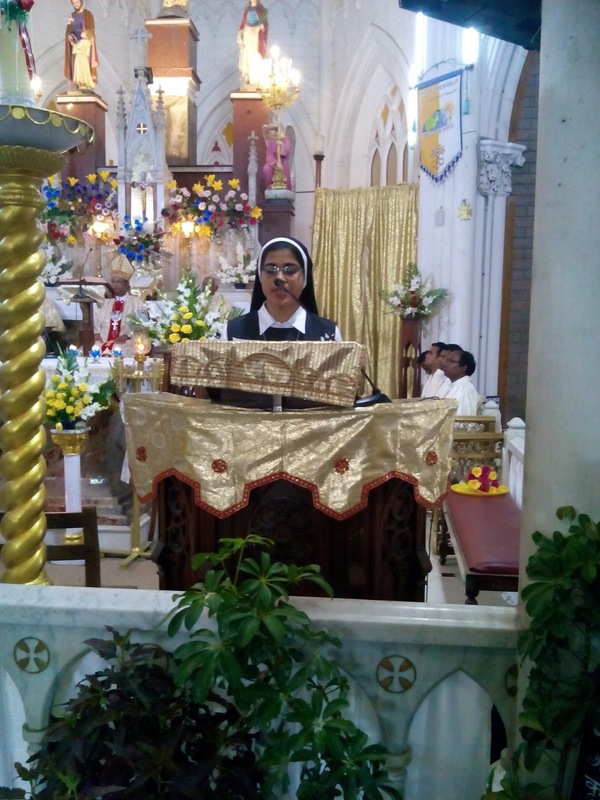 Our prayers and support are with Sr. Attracta as she moves to our Burgess Hill community to pursue nursing studies at Brighton. 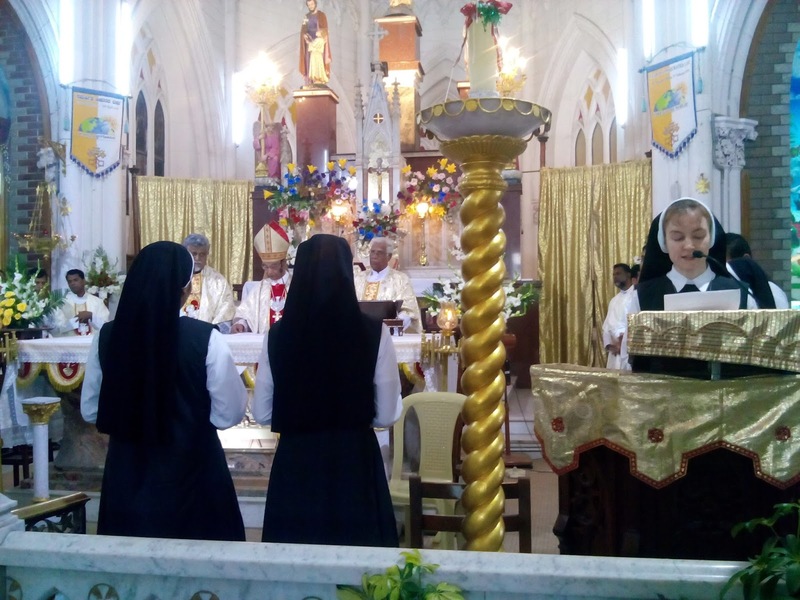 On 15th April 2015, three FMSL Sisters of our Mysore community: Sisters Elizabeth Varghese, Martha Murmu and Promodini Ekka, made their final profession of vows. 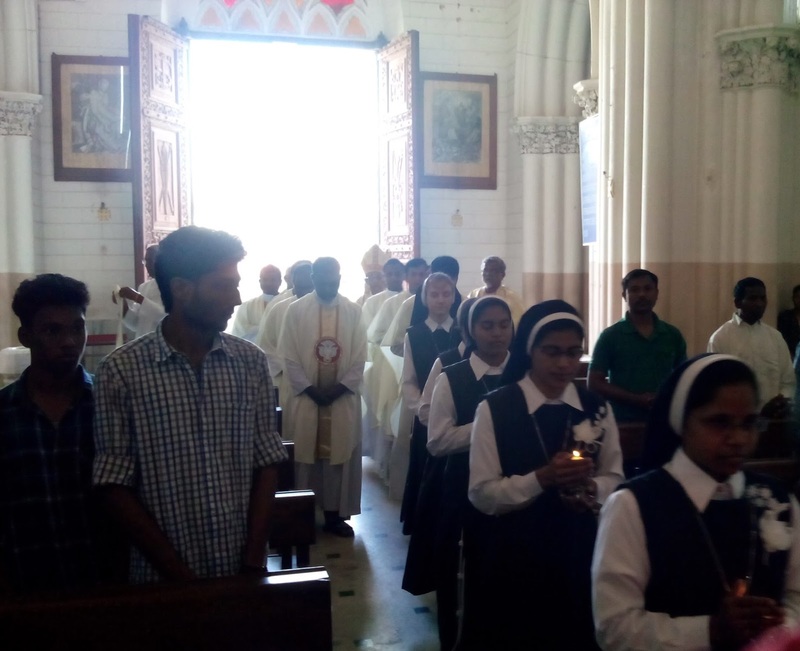 The ceremony was held during Mass in Mysore Cathedral, celebrated by Bishop Thomas Anthony Vazhapilly. Family members of the three Sisters travelled from Kerala and from as far as Orissa to celebrate with them. 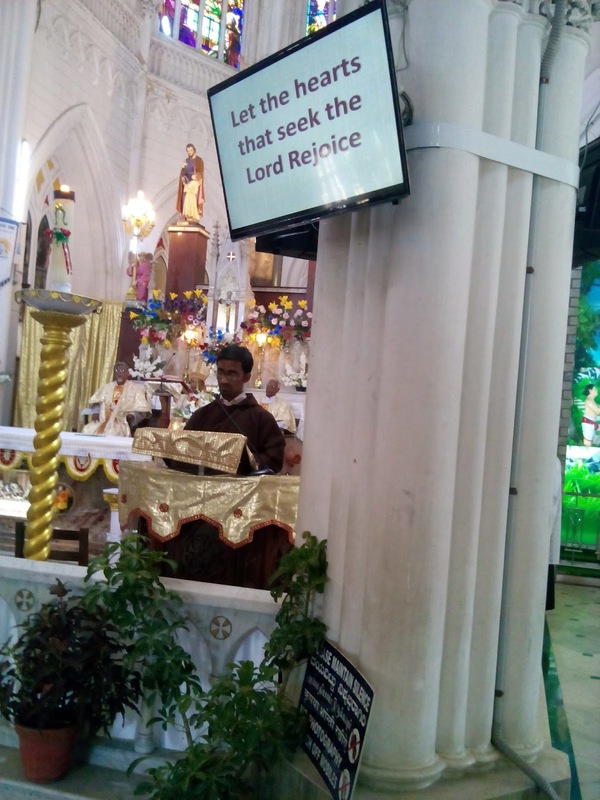 The Psalm was sung by a Capuchin Friar. 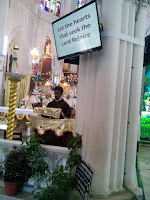 The friars kindly led the music and arranged other parts of the liturgy. Rev. 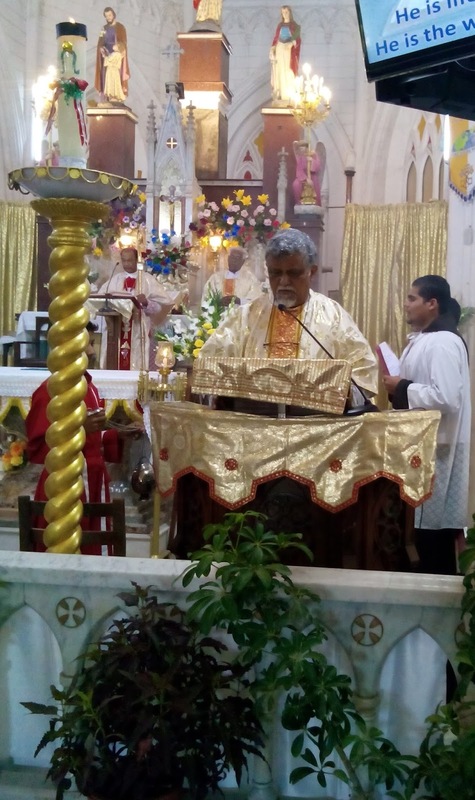 Desmond Rebello OFM Cap, Vicar for Religious read from the Gospel. 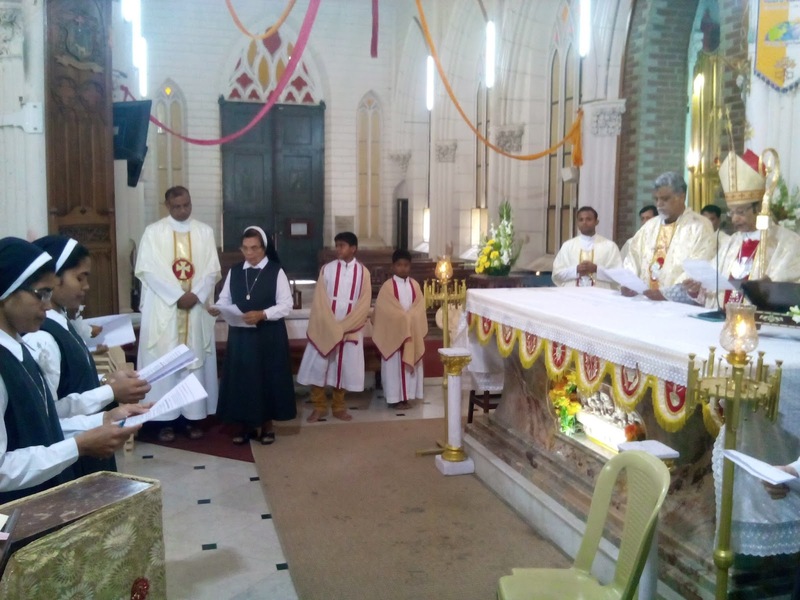 Bishop Thomas Anthony gave a homily about the role of consecrated life in the Church. 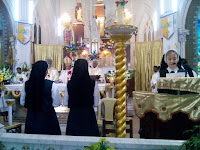 Sr. Clare Bernadette FMSL called the three Sisters to come forward. The Bishop examined the Sisters about their intention to commit their lives to God. 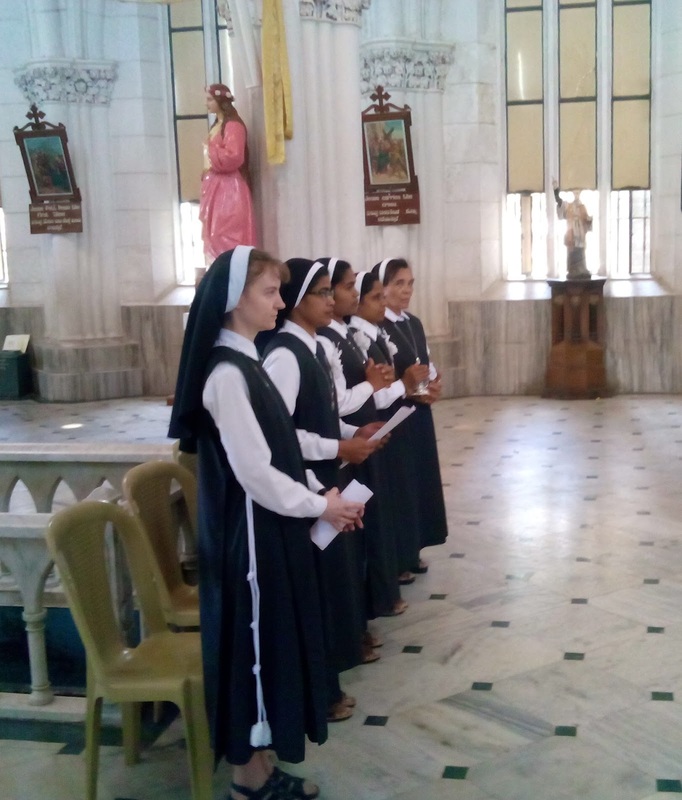 Everyone prayed for the Sisters in union with the saints as we sang the Litany. 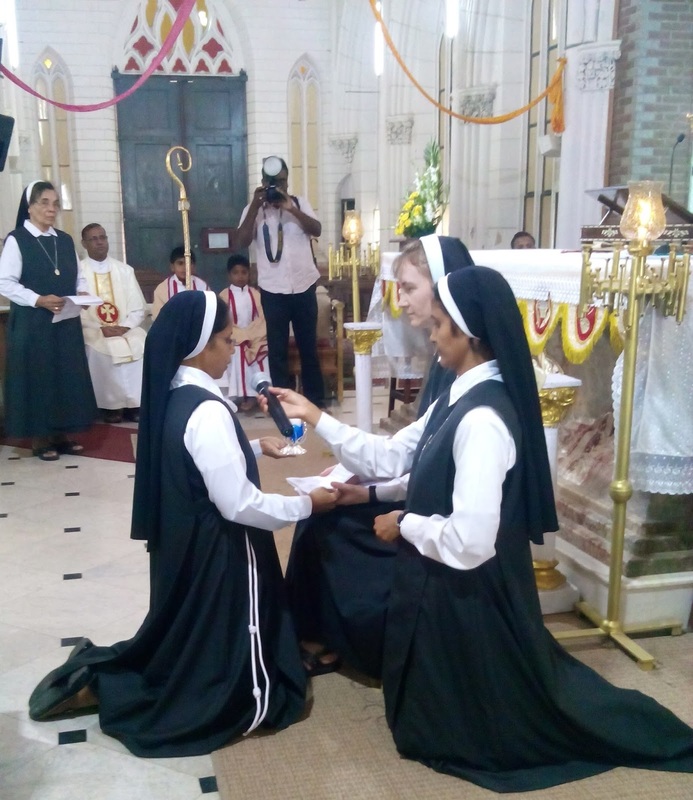 Next, the rings, the symbols of their perpetual commitment to God in love were blessed by the Bishop and presented to the Sisters. 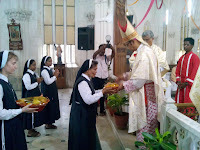 The Sisters and others brought the gifts for Mass to the altar. 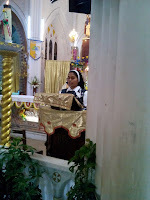 At the end of Mass, Sr. Elizabeth gave the vote of thanks. A celebration with lunch followed in the Parish Hall. Then, a photo with family outside at the shrine. 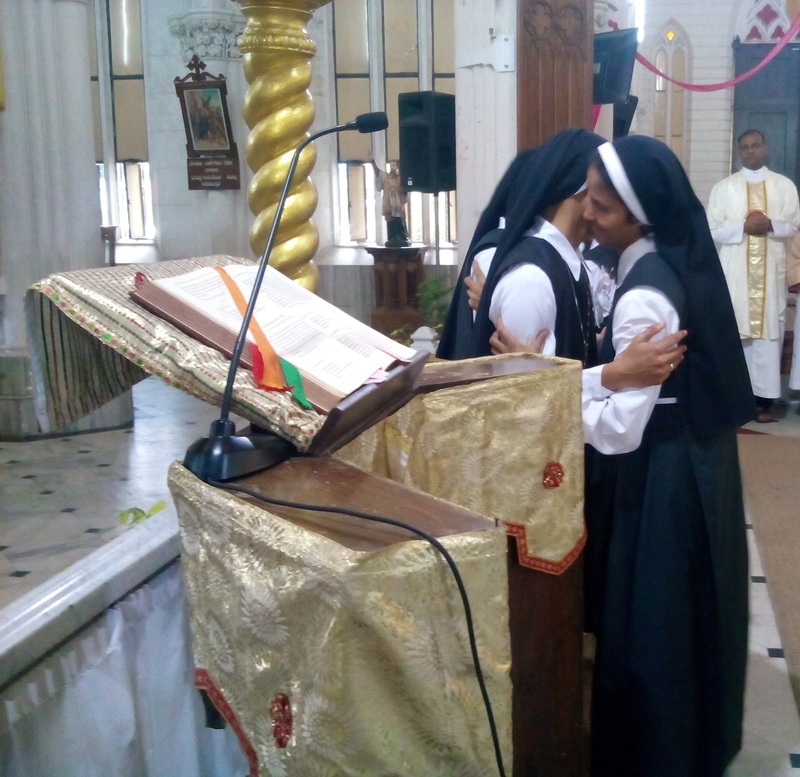 We thank God for the vocations of Sisters Elizabeth, Martha and Promodini and their wholehearted response to God's call in a lifelong commitment. 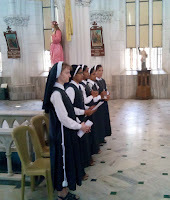 Please remember them, and our India mission, in your prayers. On 13th April 2015. 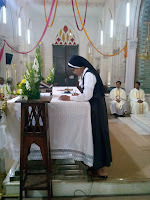 Sister Deepa Thomas FMSL made first profession of vows during Mass at St. Francis Convent, Mysore. 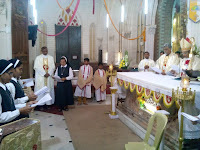 Mass was celebrated by Fr. Desmond Rebello OFM Cap. 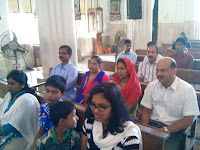 Sister Deepa's Aunt, Sr. Agnes DC came to celebrated with her. Sisters from nearby communities also came as witnesses. 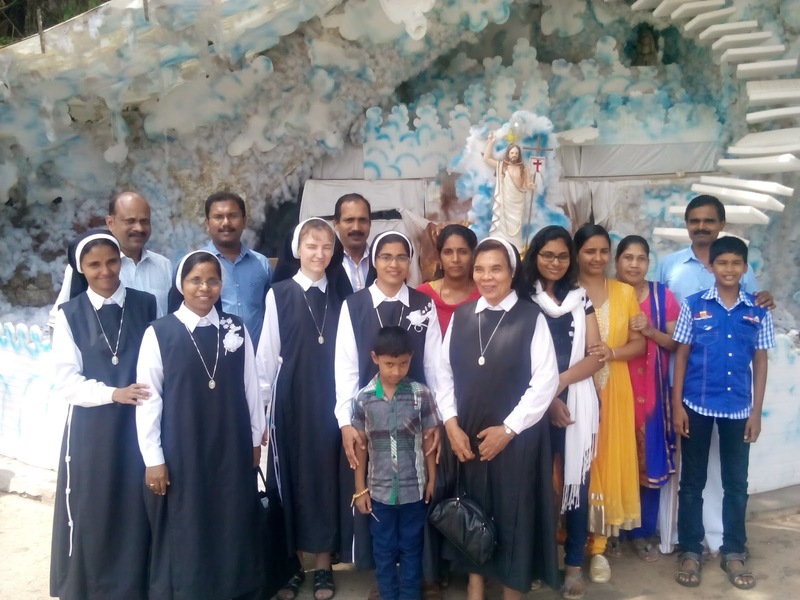 Sr. Clare Bernadette FMSL attended from England on behalf of Mother General. 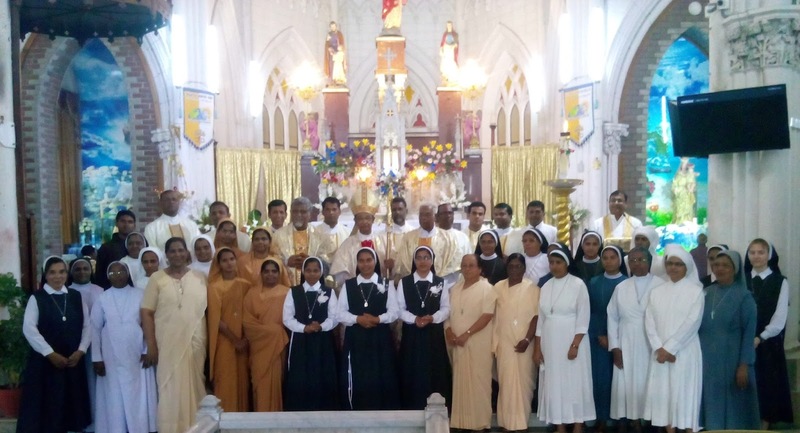 Above centre: Sr. Deepa FMSL, left: Sr. Agnes DC, right: Sr. Anne Joseph FMSL - Sr. Deepa's Formator and Community Leader. 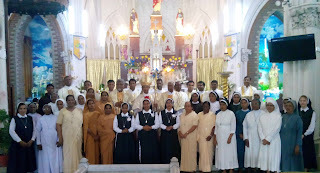 We wish Sr. Deepa every grace and blessing for the future as a professed FMSL. A Oblige the Sister to observe poverty, chastity and obedience under vow. 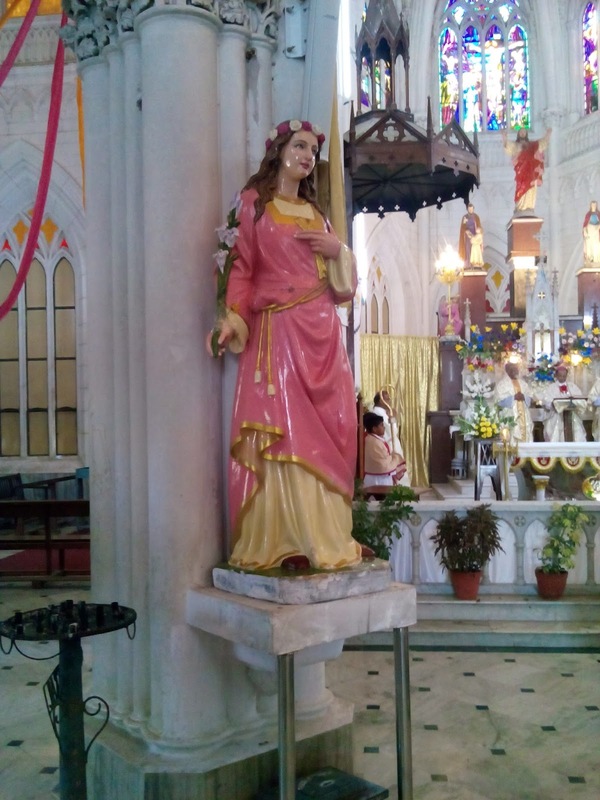 B Bind her to the Congregation with the obligation of observing the Rule and Constitutions and other regulations of the Congregation. 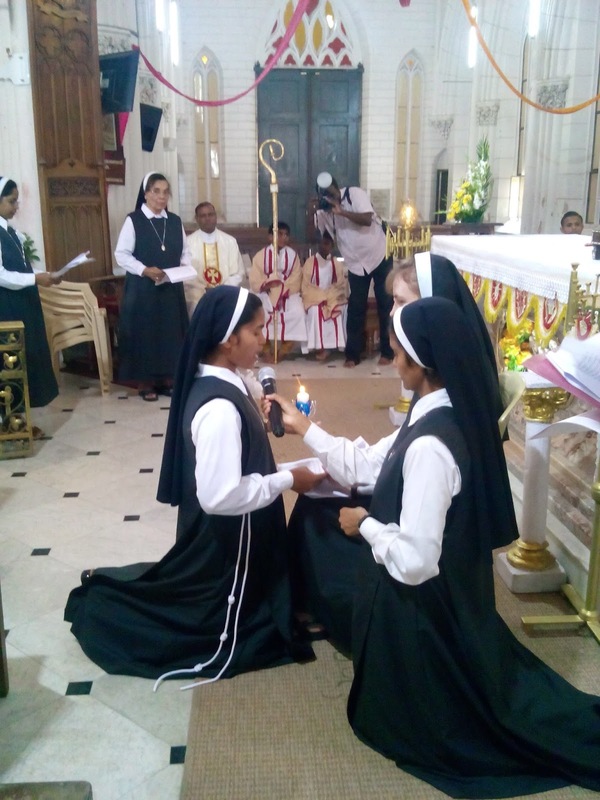 107 The spiritual and apostolic formation and professional training of the Sister will continue throughout her period of temporary profession so that she will be prepared and equipped to live her consecrated life in perpetual Profession. 107 During this period she may become involved in specific works and be given the opportunity to study for the work she is capable of undertaking in accordance with the apostolate and spirit of the Congregation. 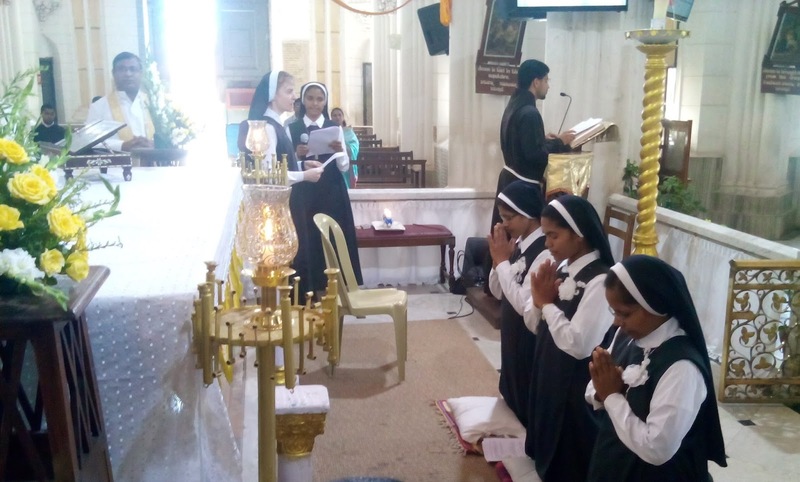 108 Temporary Professed Sisters should not be assigned to offices or work which impede their formation during the period of temporary Profession. A Deepening of prayer life through study and practice which will lead each individual Sister to assume personal responsibility for her life of contemplation. Sister Helina started to serve with the L'Arche Community in August 2014. On one day per week, she assisted with Community activities at the office in Canterbury. "The sharing of human vulnerabilities is always a new invitation to let Jesus be the centre of everything. 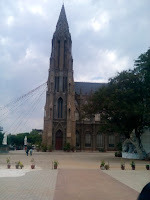 I did my apostolic work at L'Arche Community. There, I was involved in the card making group. I worked with people with learning difficulties in the morning and some came in the afternoon for social activities. It is a profound challenge to be in the presence of those whom I can hardly understand. I learned to use sign language in talking to them. I also learned to talk in a gentle voice so that they would understand me. I learned to care for and love them in whatever situation I found them." Sister Helina will make her first profession of vows as a Franciscan Sister in the FMSL Congregation in August this year. She will then be based in our Littlehampton convent, where she will continue her religious formation and studies. 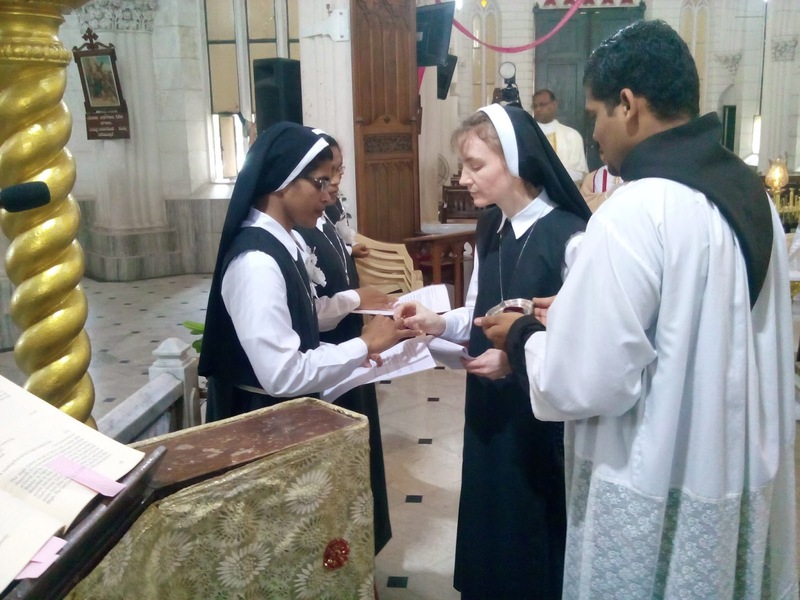 Sister Susan FMSL graduated at the end of March 2015 from a six-month programme of studies at the Franciscan International Study Centre, Canterbury. She was presented with her Certificate in Franciscan Formation together with co-student Vernon OFM. Our congratulations to both of them. Sr. Susan is currently the Formator for Postulancy in the FMSL Community in Canterbury. 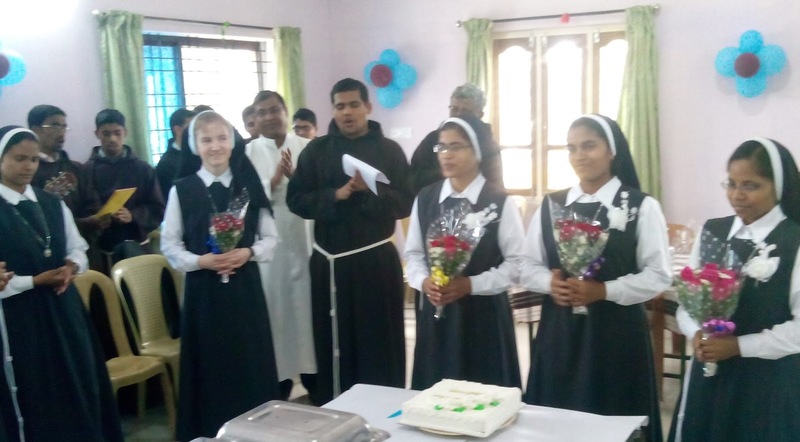 Sister Susan is shown here with Br. Vernon (centre) and fellow students Brothers Damian and Ronan OFM, who are continuing their Franciscan Studies at the FISC. The role of the Formator of Postulants brings responsibility for arranging and co-ordinating the programme of training for women who have come to live with us and discern their vocation to our way of life. 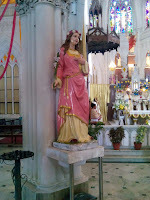 To journey with the person, to help her develop her faith and discern her religious calling. To co-ordinate the Postulancy programme and timetable. 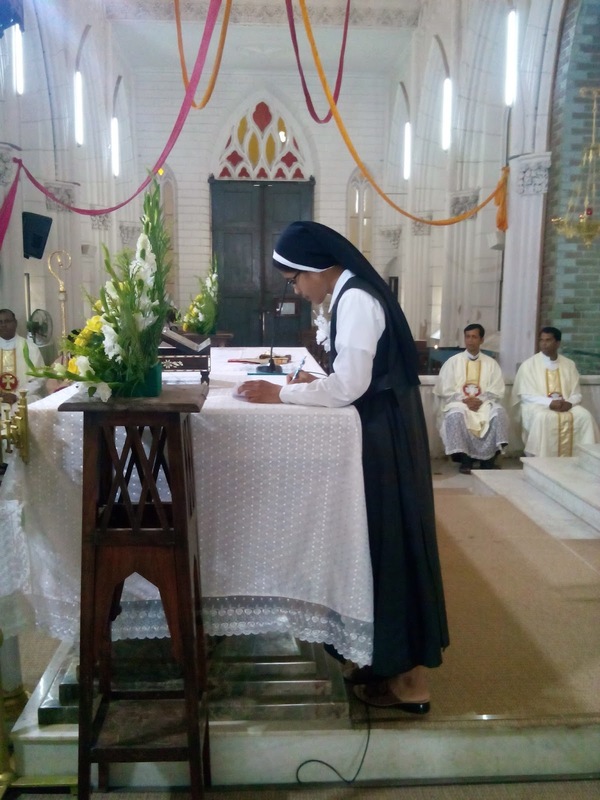 To invite the postulant to write to Mother General and Council three months prior to admission to the Novitiate as per Dir. 6.13. To be responsible for collating the reports which will allow the postulant to move on to the next stage. 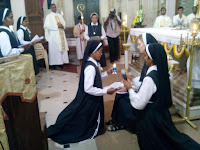 On 2nd February 2015, Marcellina and Patricia were received as Postulants in Canterbury by Sr. Susan and Sr. Clare Bernadette. This happened during Evening Prayer in the Convent chapel. 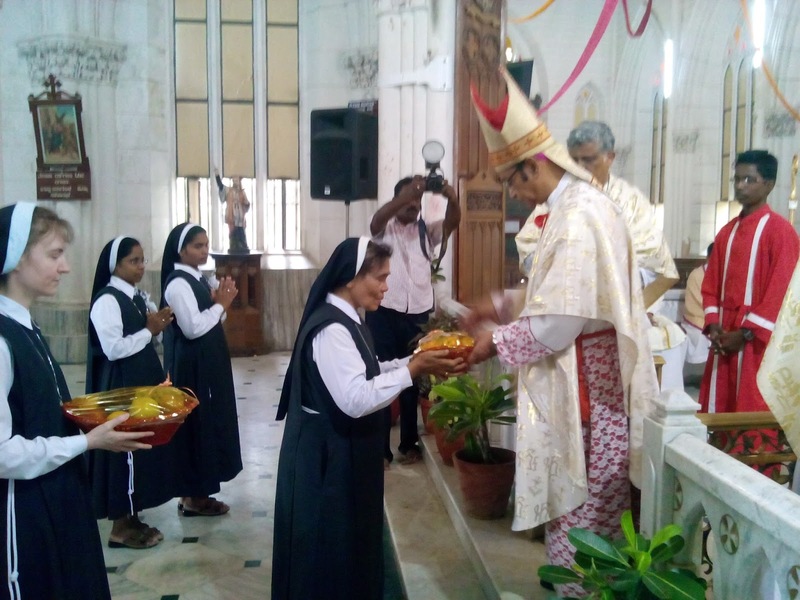 Congratulations to Patricia and Marcellina and to Sr. Susan, who will accompany them through this stage of discernment. 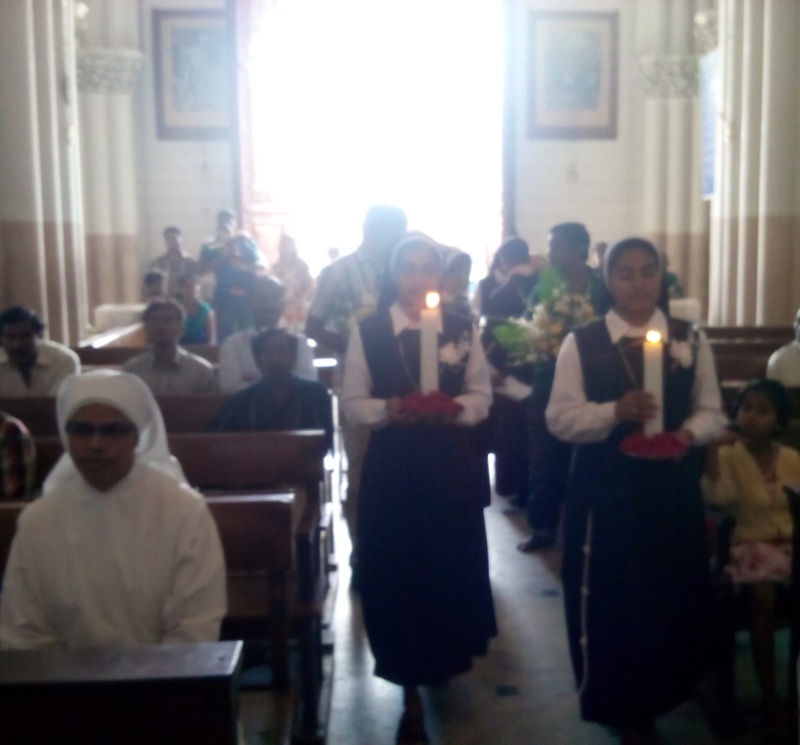 Marcellina and Patricia (centre) at their reception into Postulancy with Srs. Susan and Clare Bernadette. We thank God for the gift of these new postulants and their director, assuring them of our prayers and asking you to remember them in yours.